These pumpkin cupcakes are so yummy and really moist. There are just a few ingredients in this recipe and there are no eggs or oil in them. The pumpkin buttercream frosting is delicous. I could eat it by the spoonful! Here are the recipes if you’d like to try a nice Halloween treat. Preheat oven to 350 degrees. Pour white cake mix into a bowl. Add canned pumpkin, pumpkin pie spice and applesauce. Mix on medium speed for 2 minutes. Fill cupcake liners 3/4 of the way full with mix. If you aren’t using cupcake liners, make sure you spray your cupcake pan with a non-stick baking spray. Bake for 35-40 minutes, until a toothpick inserted in the middle of the cupcake comes out clean. Let cool thoroughly before adding frosting. These are delicious enough to eat without any frosting. Enjoy! Cream shortening and butter with mixer. Add canned pumpkin, pumpkin pie spice and vanilla. Add sugar, one cup at a time, beating well on medium speed. Scrape sides and bottom of bowl each time before adding more sugar. Beat on medium speed until fluffy. I cut back the canned pumpkin to 1/2 cup in this recipe. I used 1 cup in mine and it was way too runny. If it needs to thicken up a bit you could add more sugar to it. This frosting is really good if you need a pumpkin fix! Applesauce is a good sub for butter or oil and I am sure these cupcakes had great texture as well as taste. All that pumpkin in the frosting does sound like it would be a delicious way to top these. Yum-great post. Ooooh, a vegan pumpkin cupcake! Get down with your bad self 🙂 That pumpkin buttercream sounds outstanding! Of course it non-veganizes the cupcake but I mean really, who cares! Yum! Thanks for linking up to my blog hop! Thanks, Dee!! I’m loving your blog hop! It inspired me to look at a few other recipes that were out there and come up with my own version. I was sooo relieved when they turned out good. I didn’t even think about them being vegan. That’s a plus! You know, my son has eaten more of the pumpkin cupcakes without the frosting than he has with, he loves them. I’m thinking I could call them muffins and have them with my coffee in the morning…HA! I can never get too much pumpkin. Just love this time of year. The cupcakes sound delish. I’d def. add raisins. These sound and look amazingly yummy! Thanks!! 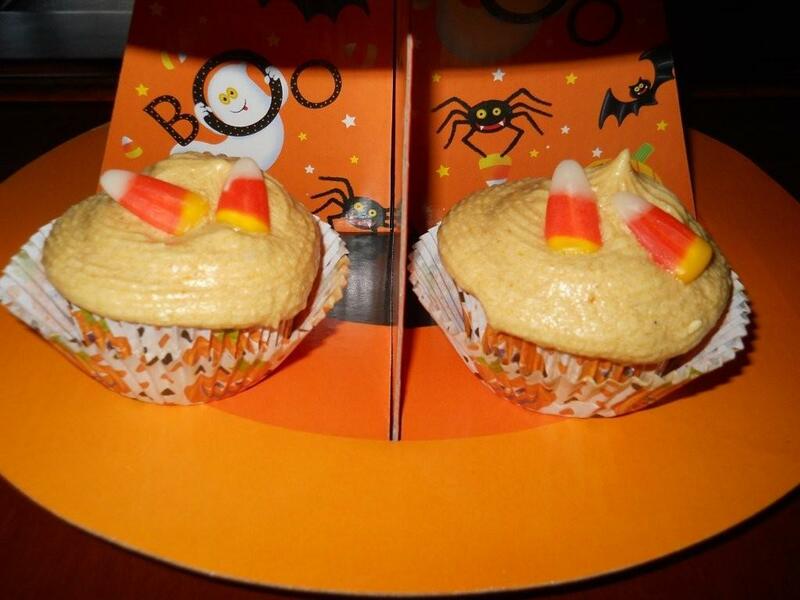 Oh, boy, my kids would love these pumpkin cupcakes! And the buttercream frosting sounds fabulous….mmmmmmm. Hi! Glad you found me…and what you were looking for!! !